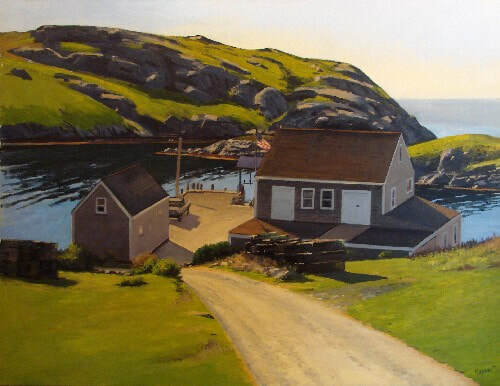 Monhegan Island has been an artist colony for more than 150 years, a favorite of great artists like Edward Hopper, Winslow Homer, Rockwell Kent and The Wyeths. They came for the light, the quiet calm in the atmosphere and it’s leisurely rhythm. In this workshop we carry on this great tradition and paint the Islands landscape en plein air, gathering at various locations around the village, lighthouse, small coves and craggy coast. Painting from life outdoors is regarded as the best way to train your eye how to really see like an artist and accurately represent natures light, form, color and atmosphere on a two dimensional surface. Through demonstration, discussion and critique, we will simplify the outdoor painting process. Emphasis will be on capturing the changing light, composition and technique. This is a relaxed workshop and all levels are welcome. This reservation fee of $200.00 is non-refundable if cancelled less than sixty days before the workshop. Please pay in full the remaining $295.00 balance no later than thirty days before the workshop. I have blocked rooms at the The Monhegan House and I will be staying there. Breakfast is included in room rate. Tell them you are with the Kevin Beers workshop. This is where we will meet every morning at 9:00 after breakfast. (Reservations begin on January 1st, best rooms go first so call soon). There are other great choices and most places are within easy-peasy walking distance to the village. *Also see www.Monheganwelcome.com for additional accommodations and island info. In 2007 the Monhegan House added two more rooms (suites), that have their own bathrooms and a deck... a little more money, but if you like having yourown bathroom, they are perfect. (There are three options for Ferries to and from Monhegan Island. I drive up to Port Clyde and take the Ferry there myself but the other two options are perfectly good ones. Parking is about $5 per day at Port Clyde and safe. There is a gift shop and restaurant rite there at the dock. Last year we bought fresh cooked lobsters on the pier from lobstermen for $3 each...we inhaled them). ​(The largest number of trips run from Port Clyde each day). Julian half box easel. I like it because it gives you flexibility- you can paint small or I paint up to 45x60” on mine. (And besides, I’m just old fashioned and it’s what I’m used to. I have been using them for something like 40 years. I don’t know much about those new fangled plein air boxes. When I started out I used Winsor and Newton since that was supposed to be the Cadillac of oil paints. But they had small caps and when I was outside painting I often struggled with them. I discovered Rembrandt paints which had and still have huge caps. That was the deciding factor... And it turns out they are great paints. As you may know I am a disciple of Edward Hopper. I always assumed he used Winsor and Newton and felt I was being unfaithful using Rembrandt. Then a book of his notebooks came out and I discovered that he used Rembrandt. Phew! I was redeemed. For my white, however, I use Winton Titanium White. It’s considered student grade but I think it works great and it’s cheaper...I use a lot of white. A teacher years ago told us that if you want to paint loose and thickly, it was good to use cheap paint because it has a higher ratio of the filler to the pigment. Old Holland, for instance, has much more pigment and it tends to be good for painting thinly and for glazing. I use 200 ml tubes so I always have plenty of paint. Quinacradone (I use this instead of Cadmium Red. If you use it by itself it is a nice cool red but if you mix it with yellow or orange you get a nice hot red like a Cadmium. That’s not to say you might not want a Cadmium Red too). Kooky list isn’t it? This is just what I have arrived at over time by experimenting with various colors. It is not to say this is what you have to use but it works for me. My go to medium (again kooky) is Copal Medium. It’s just an old habit. I used to love the smell. It used to smell like oranges. Not anymore. I don’t know why. It’s funny that I do use it because it is somewhat fast drying and I like my paint to stay wet so I can mush into it. I really only tend to use it to get started when I want to cover a lot of ground quickly. Lately I use less and less medium. I like paint. Ray Mar boxes for carrying panels. !1x14 is my go to size. Sometimes 12x16. And if I really want to quick sketch I will occasionally do a 6x8. Mainly though I like to paint 18x24 on canvas. That is if I am someplace like Monhegan where I can go back again and again at the same time every day to paint. I like to spend time with a subject and dig in. If you are painting 18x24 and you use a Julian half easel you can carry two canvases on it. That’s convenient. A: On the first day, Friday, we will meet at noon in front of the porch of the Monhegan House. You can't miss it, its in the center of the village next to the church. Look up and you can see the church steeple from almost anywhere in the village...head in that direction. We will get acquainted, I will demonstrate and then we will spend the rest of the day painting. On Saturday and Sunday, we will meet on the porch of the Monhegan House at 9am each morning. we will make our way to our painting site, there will be a painting demonstration and we will paint until noon. Break for lunch and continue to paint until 4pm. During the day, I will come around to each student and offer suggestions and answers to request for assistance. Monday will be the same schedule, however, The last ferry leaves before 5, so we will be sure and wrap up in time to make it. Typically, we paint until about 1pm and then make our way to the ferry area for coffee, buying gifts and simply settling before the ride back. Q: Is this workshop appropriate for beginners. A: Yes. This is a relaxed workshop appropriate for beginners to experienced painters. By relaxed, I do not mean a painting vacation, on the contrary, it is packed with information and you will learn a lot. It is relaxed in that you are welcome to go at your own pace and not to feel like you have to keep up with others. We typically have beginners, and / or a number of artist who have never painted outside before, in addition to some moderate to more experienced painters. Its a good mix of an extremely supportive group of like-minded painters trying to solve the same problems. Q: Is there a lot of walking? A: There is light to moderate walking required to get to some of our painting locations, appropriate footwear is suggested. It is also recommended to pack light painting gear. On occasions, an island local will drive us to the lighthouse or other locations with all of our gear for $5 per person. Q: What if I wanted to use Water mixable oil paints? A: This workshop is relaxed and appropriate for Water mixable oils, pastels, acrylics, watercolor or even sketching. Instruction will include discussion of the principles of art, seeing like an artist and picture making. These lessons are applicable to any medium. I will be working and demonstrating in oil paints so you will definitely benefit the most from using oil paints yourself. A: We will sing songs with the word rain in it. Painting options include working under the covered porch at the Trailing Yew or, on occasion, the owners of the Fish store at Fish beach will sometimes put up a tarp that we are welcome to paint under. 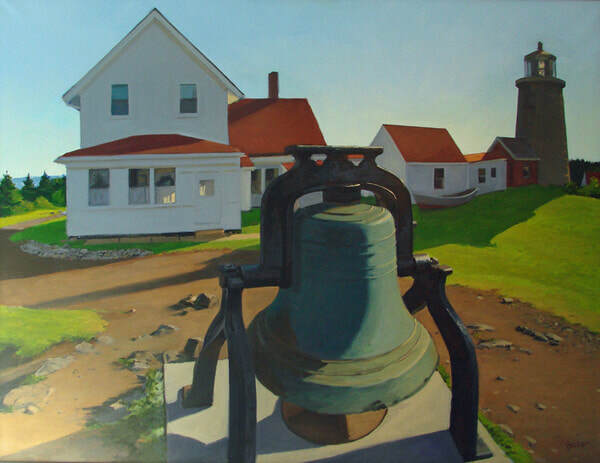 This can also be a great opportunity to paint indoors at the Monhegan Inn and practice turning your outdoor studies into finished studio works.